Vivion Smith, the gorgeous vocalist and keyboardist of Juniper Lane, was stunning tonight at Iota with great stage presence and sense of humor. It surprised no one that Juniper Lane drew a crowd tonight, as the DC native band has been featured on The Hills as well as opened for Coldplay recently. Plus the band has been featured in Washington Post's Picks as well giving them a positive album review. Tonight featured a battle of amateur singers at the Rock And Roll Hotel on H street. Usually the karaoke contest is held at the nearby Sticky Rice sushi lounge. The Hotel was pretty well attended for a Tuesday night, and several of the karaoke performances featured creative props and memorable performances, for the better or worse. Went down to Dupont Circle tonight for another round of salsa dancing at Lucky Bar. I missed the free 8pm class, which I hear was very popular. This was the most crowded I've ever seen this venue. The combination of many people getting off work tomorrow for Veteran's Day and the temporary closing of another nearby salsa bar lead to a massive crowd of people packed into Lucky Bar. Dancing isn't easy for me, but its even more challenging when the floor is completely full. We had to constantly dodge other couple's elbows flying our way and try to avoid drunkies spilling their glasses over us as they jostled past. Got a second dose of salsa dancing tonight at Cecilias near Arlington Cinema Drafthouse. About one third of the building is a Spanish restaurant and the rest is a large open dancefloor, bar, and stage for a live band. Tonight was the first night of lessons for their new dance instructor, and although men outnumbered women for this class (unusual for this venue) it was alot of fun and worth the $10. Its a very reasonable price considering you get both a beginner's class and an intermediate class back to back. No expierence needed, but of course it never hurts to stock up on some liquid confidence at the bar first. I figured the election was practically over at 10pm tonight when it appeared that Ohio was going blue, and I stopped watching the political coverage. But then I was startled by yelling and cheering from Wilson Blvd at 11pm. As soon as it was announced that Senator Obama would sweep past 270 elector votes, a loud and energy filled hoopla erupted from Liberty Tavern. I believe Liberty was one of the gathering spots for Democrats to watch the election outcome tonight, with the GOP hanging out at Mister Days. Celebrations are sure to continue all night long in Clarendon. Lucky Bar near Dupont Circle is a dynamic multi-level little hangout tucked away on Connecticut Avenue. When entering the first level it seems like a small sports themed dive bar, but on the next level behind the bar is a narrow dance floor flanked by a pool table and a row of booths. A giant projector screen allowed me to witness the Redskins getting pumelled by the Steelers. There is also a third level tucked away between a staircase that I didn't explore. The place really comes alive after 8pm on Mondays when the free Salsa dancing lessons begin. Unfortuately tonight the instructor called in sick, so I had to dive into the new experience of the four step dance on my first time. Still a very fun night in a relaxed bar thats an easy walk from Farraguat North metro station! 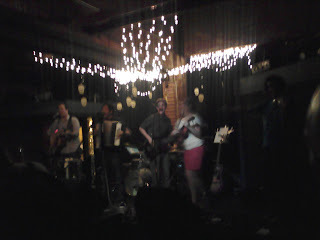 The six musician strong La Strada took me by surprise tonight at Iota with their folk beats and incredible energy. They brought a wealth of instruments to the stage, including guitars, bass, violin, viola, xylophone and even an accordion! I loved how the performers switched easily between the mediums, even changing between a bass and the accordion during a song. Every song seemed noteworthy, but I'll be concise and just point out how entertained I was when one set included the violinist whistling instead of singing. They are in my top five live shows I've seen so far. Got the chance to hang out with some RC Groups members at Kennmore Middle School. 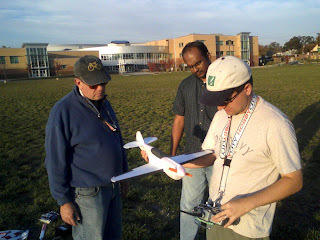 Building and flying remote controlled planes and helicopters can be a very addictive hobby once you get bit by the RC bug. The afternoon was mostly dominated by homemade foam airpanes ("foamies") of different scales. 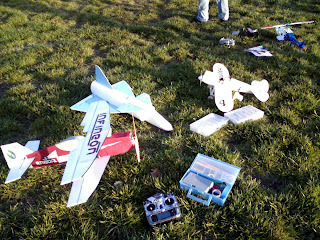 A few T-Rex model helicopters made an appearance, deftly executing rolls and loops. The members are very friendly and range from amateurs flying Air Hogs toys (like me) to experts willing to share all their flying knowledge. The group usually meets up every week at local school soccer or baseball fields, and I would recommend anyone check it out sometime.